A snuggle and a cuddle will definitely keep your little dog all warm, but they still need some comfortable dog clothes to wear just in case they decide to play in the snow or prance in the rain. 1. Be a show stopper with a dress coat. The dress coat doesn’t only cover a big portion of the dog’s body, but will also make him fit for any type of runway, even if it’s just a walk in the park. A lot of these dresses have faux fur collar to keep the neck and the face of the dog warm at all times. 2. Get into the mood of Christmas with a little Santa costume. Let the season be a lot merrier especially for your little one, as you let him sport that cute little Santa costume. To finish the look, add some colorful red ribbons and great Christmas cheers. 3. Go checkered with plaid jackets. Plaid jackets are perfect for the more modern and cosmopolitan small dogs. They are stylish, yet classy and sophisticated. What’s more, you can pick from the current season’s fashion collection. They are made of much thicker materials in order to combat the sudden chills brought about by autumn and winter winds. 4. Have fun outdoors with waterproof jackets. A more advanced and innovative type of dog jacket will be the waterproof coat. It prevents water from getting inside the jacket and into the fur of your small dog, allowing him to be warm at all types. It also normally comes with Lycra panels, so you can fit the jacket perfectly into the size of your small dog. 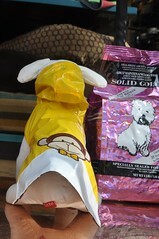 Lastly, the insulation permits the body heat from being trapped into the belly and chest of your little pup. 5. Be very hip with hoodies and detachable caps. Dog hoodies are comfortable when out in the running field, and will also keep the cold away. What’s more, they come in various designs and prints, allowing your dog to make his own fashion statement. To make them even more versatile, you can choose pieces with removable hoods – two outfits in one! 6. Groove with the corduroy jackets. Bring back the vintage 70s with dog jackets made of corduroy. They are very soft to touch, comfortable to wear, and fits snuggly into the body of your small dog. What more can your little pup ask for? With such a wide variety of dog jackets available for winter you will be truly spoilt for choice. Dog clothes are available from your local pet store, or online specialty stores. Beverly Maniago has earned her AB Mass Communication major in Journalism. She loves writing articles and web content. Being a full time writer, she produces quality articles and press releases for different clients and companies.